FRAMINGHAM, Mass., September 25, 2018 – According to the International Data Corporation (IDC) Worldwide Quarterly Converged Systems Tracker, worldwide converged systems market revenue increased 9.9% year over year to $3.5 billion during the second quarter of 2018 (2Q18). "Datacenter infrastructure convergence remains an important investment driver for companies around the world," said Sebastian Lagana, research manager, Infrastructure Platforms and Technologies at IDC. "HCI solutions helped to drive second quarter market expansion thanks, in part, to their ability to reduce infrastructure complexity, promote consolidation, and allow IT teams to support an organization's business objectives." IDC's converged systems market view offers three segments: certified reference systems & integrated infrastructure, integrated platforms, and hyperconverged systems. The certified reference systems & integrated infrastructure market generated $1.3 billion in revenue during the second quarter, which was a year-over-year decline of 13.9% and represented 38.1% of total converged systems revenue. Dell Inc. was the largest supplier in this market segment with $639.8 million in sales and a 47.5% share. Cisco/NetApp generated $481.0 million in sales, representing the second largest share of 35.7%. HPE generated $108.4 million in sales, representing 8.1% market share. Integrated platforms sales declined 12.5% year over year during the second quarter, generating revenues of $729.4 million. This amounted to 20.7% of the total converged systems market revenue. Oracle was the top-ranked supplier of integrated platforms during the quarter, generating revenues of $440.6 million and capturing a 60.4% share of this market segment. Revenue from hyperconverged systems sales grew 78.1% year over year during the second quarter of 2018, generating $1.5 billion worth of sales. This amounted to 41.2% of the total converged systems market. IDC offers two ways to rank technology suppliers within the hyperconverged systems market: by the brand of the hyperconverged solution or by the owner of the software providing the core hyperconverged capabilities. Rankings based on a branded view of the market can be found in the first table of this press release and rankings based on the owner of the hyperconverged software can be found in the second table. Both tables include all the software and hardware revenues, summing to the same market size. 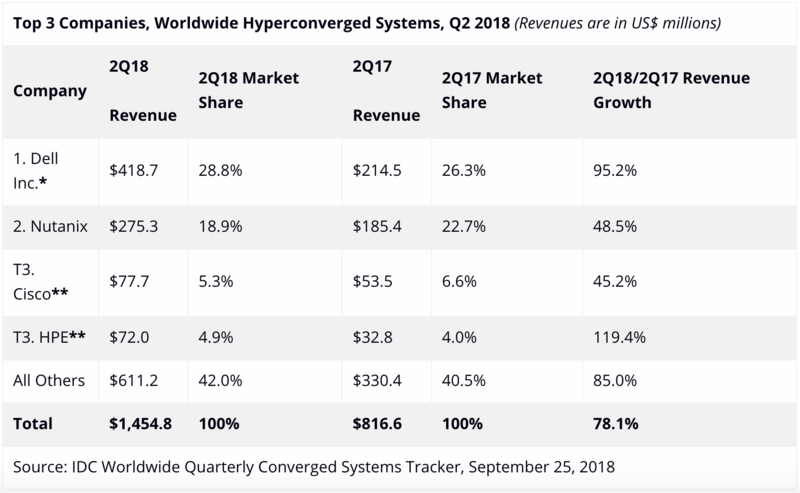 As it relates to the branded view of the hyperconverged systems market, Dell Inc. was the largest supplier with $418.7 million in revenue and a 28.8% share. Nutanix generated $275.3 million in branded revenue with the second largest share of 18.9%. Cisco and HPE were statistically tied** for the quarter, with $77.7 million and $72.0 million in revenue, or 5.3% and 4.9% in market share, respectively. Dell Inc. represents the combined revenues for Dell and EMC sales for all quarters shown. IDC declares a statistical tie in the worldwide converged systems market when there is a difference of one percent or less in the revenue share of two or more vendors. 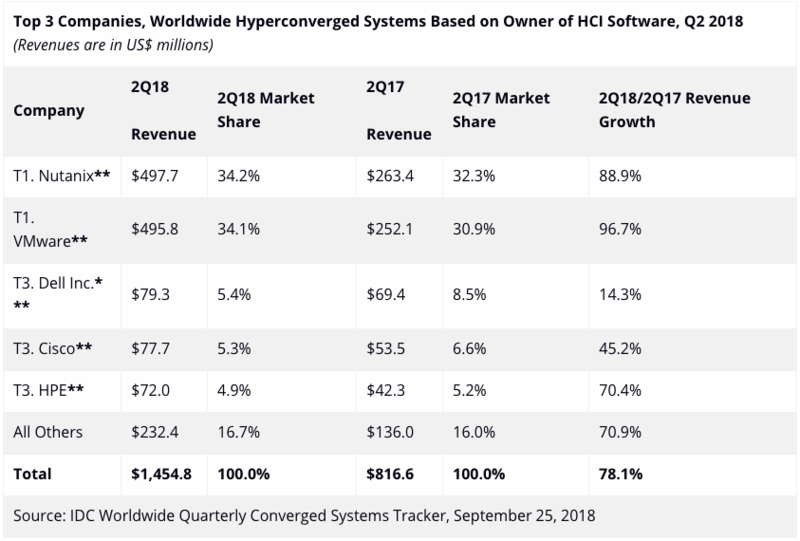 From the software ownership view of the market, systems running Nutanix's hyperconverged software represented $497.7 million in total second quarter vendor revenue, or 34.2% of the total market. Systems running VMware's hyperconverged software represented $495.8 million in second quarter vendor revenue, or 34.1% of the total market. Both amounts represent all software and hardware revenue, regardless of how it was ultimately branded. IDC defines converged systems as pre-integrated, vendor-certified systems containing server hardware, disk storage systems, networking equipment, and basic element/systems management software. Systems not sold with all four of these components are not counted within this tracker. Specific to management software, IDC includes embedded or integrated management and control software optimized for the auto discovery, provisioning and pooling of physical and virtual compute, storage and networking resources shipped as part of the core, standard integrated system. Numbers in this press release may not sum due to rounding. Certified reference systems & integrated infrastructure are pre-integrated, vendor-certified systems containing server hardware, disk storage systems, networking equipment, and basic element/systems management software. 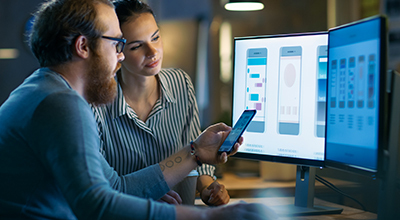 Integrated platforms are integrated systems that are sold with additional pre-integrated packaged software and customized system engineering optimized to enable such functions as application development software, databases, testing, and integration tools. Hyperconverged systems collapse core storage and compute functionality into a single, highly virtualized solution. A key characteristic of hyperconverged systems that differentiate these solutions from other integrated systems is their scale-out architecture and their ability to provide all compute and storage functions through the same x86 server-based resources. Market values for all three segments includes hardware and software but excludes services and support.